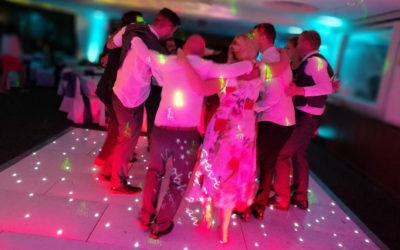 When you’re choosing your wedding DJ in Dorset, Hampshire or Wiltshire it’s essential that you ask the right questions. But there’s one problem… You’ve probably never booked a wedding DJ before so you’ve no idea what you should ask! Don’t worry, we’re here to help you choose a great wedding DJ and avoid the amateurs who could ruin your night. 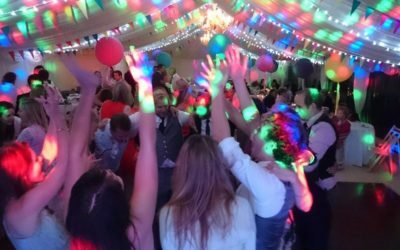 Here at Party Dexx we’ve been providing wedding DJs in Dorset, Hampshire & Wiltshire for over 13 years. 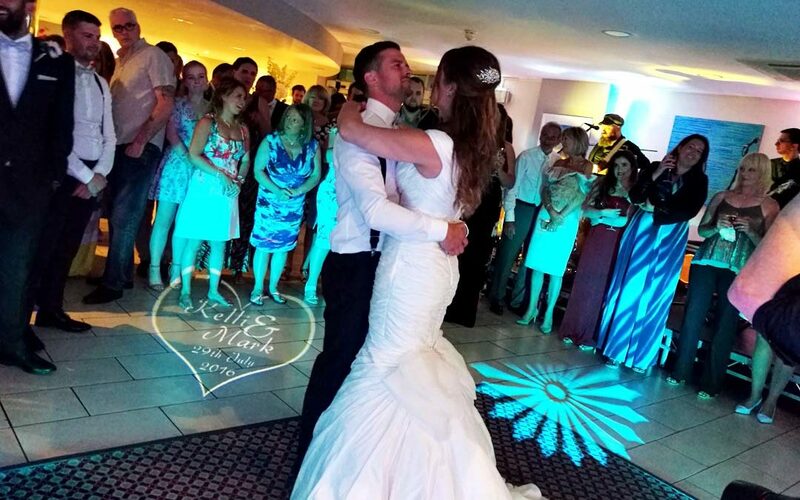 We know what makes an awesome wedding DJ and we know exactly what questions to ask to ensure you’re in safe hands as you celebrate your big day. 1: Can I Give You a Playlist? Do You Guarantee To Play The Music We Want At Our Wedding? A good wedding DJ will understand that your music preferences matter, a lot. They’ll be happy to accept a playlist from you and will take the time to explain to you how they’ll use it to make your night unique. They’ll have a good knowledge of what songs work well and which ones are likely to clear the dance floor. They’ll help you to craft the perfect playlist giving you the opportunity to tell them the music you love and the music you hate. A really great DJ will base the music on your playlist, whilst reading the crowd and mixing in other similar tracks that he knows will work. creating your playllist is not just s simple as writing down a list of songs that you like. If you want your wedding to end with an awesome party its’ essential you get it right. We’ve written a blog post to help you here called “ How To Create The Perfect Wedding DJ Playlist“. What to watch out for? Some DJs will agree to you giving them a playlist but don’t actually play it on the night. By the time you realise this it’s too late. You can avoid this by choosing a Wedding DJ like Party Dexx, that guarantees to play the music you want or your money back. Click here to see how our guarantee works. 2: Do Your Wedding DJs Have PLI (Public Liability Insurance), PAT Certificates (Portable Appliance Testing) & Do You Buy Your Music Legally? Checking for PLI & PAT certificates is not only a necessity for many wedding venues but it’s also a great way to find out if your Wedding DJ is a professional. Experienced wedding DJs will always carry PLI insurance. It’s not expensive and it shows that they take their business seriously. Many venues will insist on it too – If your DJ shows up on the night without PLI they may even refuse to let him in the building. PAT certificates are often demanded by the venues too as it ensures that all electrical equipment is in good working order and not likely to start a fire or cause a power cut. A good wedding DJ will PAT test their kit every year because they want to be sure their equipment is safe. They’ll have a certificate they can send to you to prove they’ve done this. Don’t be afraid to ask for it. You might wonder why it matters to you if the DJ buys their music legally or downloads it from an illegal streaming site? Well, firstly if your wedding DJ is illegally downloading music they are at risk of prosecution which could result in hefty fines or even a prison sentence. For most wedding DJs that would be enough to put them out of business and you’d be left out of pocket with no DJ on your big day. Secondly, illegally downloaded music is often poor quality with fuzzy, crackly sound and even people talking over the tracks! Choose a DJ who buys their music legally from itunes or another big music supplier to be sure you’ll have great sound. What To Watch Out For? Some wedding DJs may say they have current PLI and PAT when they don’t. Ask to see their certificates before you book them. A good wedding DJ will happily oblige. 3: Do You Carry Back Up Equipment? This is soooo important. Most wedding DJs these days work from some variation of a laptop, mixer/controller and speakers for sound. Plus a small selection of lights for the “disco effect”. Both sound and lights are essential for a great party but many, many wedding DJs don’t carry any backup equipment! This is totally unacceptable. Ask your DJ what happens if his laptop fails? What does he carry as an alternative if his amp or speakers blow? Doe she carry a spare of all the essential cables? And a spare mic? A great wedding DJ will know that no matter how new or well maintained his equipment is, there is always a risk of technical failure and he’ll have a plan to deal with it that will ensure you’re guaranteed sound and lights all night long – even if something breaks. What To Watch Out For? Watch out for DJs who can’t answer your questions about backup plans or who tell you “their equipment is high quality and never fails”. That may be the case to date, but what happens if he drops the laptop as he’s setting up or someone spills a drink on his controller? A great wedding DJ will understand these risks and have a plan to keep the party going in the event of a disaster. 4: What Happens If You Get Sick? Do You Have Someone To Cover? This is definitely a good reason to avoid hiring a one man band and certainly something to ask your wedding DJ. What if your DJ gets sick at the last minute? Does he have someone who can cover for him? How does he know they’ll provide the same service that he’s promising? Has he used this DJ before and had great feedback? Over the last 13 years we’ve had multiple calls from desperate bride’s looking for a DJ to cover their wedding ON THE DAY because their DJ is sick and has no one to step in. The safest option is to book a company with multiple DJs so that if one is sick there are more available who will provide the same standard of service with no extra hassle or stress for you. What To Watch Out For? Be wary of wedding DJs who tell you they “never get sick” or admit they have no one to cover. The last thing you want is to be let down at the last minute – or worse, end up with a DJ who coughs all through your first dance because he should be home in bed! 5: Can You Mix and Beat Match? Anyone can press a play button but it takes real talent to create an awesome party. The industry is full of part-time, unprofessional wedding DJs who have bought some lights and speakers and now consider themselves a DJ. If you want to be sure of a great night you’ve got to choose a talented professional. A talented wedding DJ does so much more than just play music. They will be able to mix one track into the next, beat matching perfectly and ensuring your music keeps playing seamlessly all night. They’ll have an excellent knowledge of all music genres and will be able to read the crowd, responding to what works for them and tailoring the music around your preferences and what your guests get up and dance to. 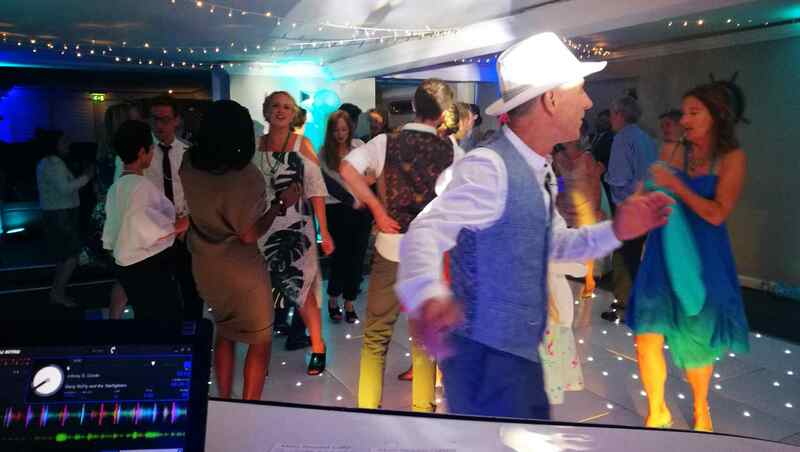 By choosing a wedding DJ who can beat match and mix you’ll be certain that they’re a “real”, professional wedding DJ who takes their job seriously, not just someone out to make some cash at the weekends. Ask your wedding DJ to hear a sample of some songs they have mixed and they’ll be happy to oblige. What to watch out for? Watch out for wedding DJs who give you cheap quotes. A professional wedding DJ will not be cheap. They’ll have costs to cover such as insurances, vehicles, equipment etc. Talented DJs know their worth so if your wedding DJ is quoting cheap you have to ask yourself, is that DJ a professional? Which corners is he cutting in order to deliver at such a low price? 6: Have You Worked At Our Venue Before? If Not, How Do You Handle This? Choosing a DJ who knows your venue can make things much less stressful. If they’ve worked your venue before then they’ll know the access route, how the room turnaround usually works and where to set up on the day. They’ll probably know your venue coordinator too and will liaise with them in the run up to your big day, giving you one less thing to worry about. If they haven’t worked your venue before that’s no big problem. A really great wedding DJ will understand the importance of making your day stress free and will be willing to do a site visit before the day to check out access and see where they’ll be setting up. What to watch out for? Be wary of a wedding DJ who tells you he doesn’t know your venue and he doesn’t need to see the venue before the big day. Going in to a venue blind can create multiple problems and delays. 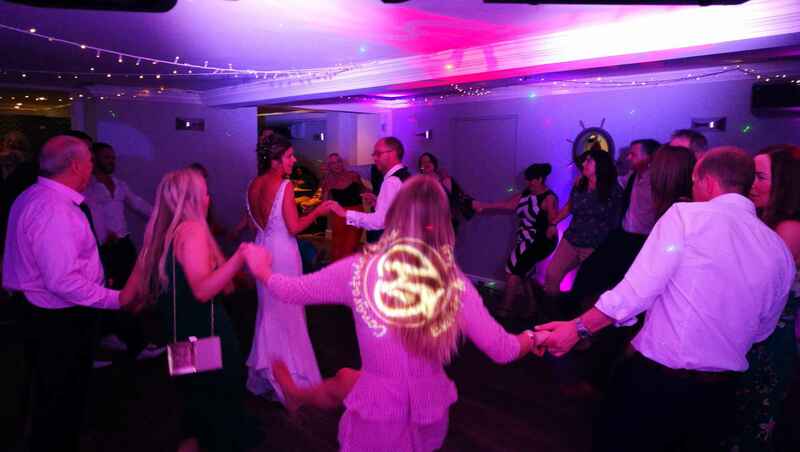 A professional wedding DJ will be not only willing but keen to make site visit so he can be certain to provide you with an excellent service on the day. 7: Do You Have Any Case Studies Or Testimonials? Such an important question to ask. You only get one chance to get your wedding disco right. 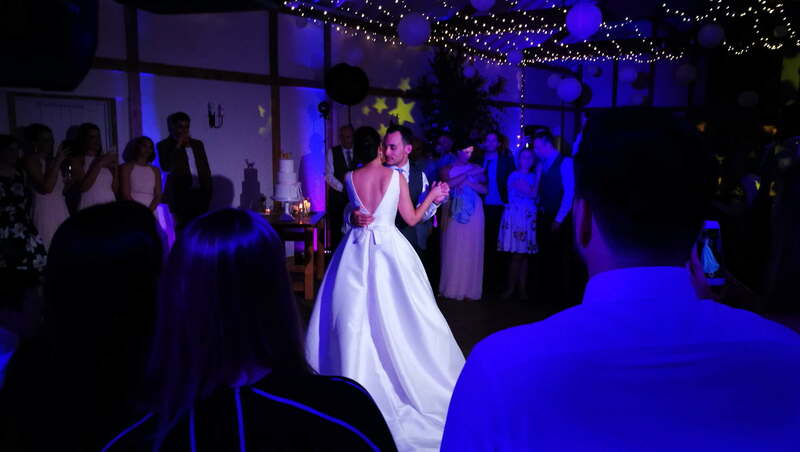 Choosing a wedding DJ with lots of testimonials and reviews will help you to ensure that they are experienced, reliable and that you can trust them to deliver what they promise. Your wedding DJ should be able to show you lots and lots of testimonials on their website, on their Facebook page and in their Google maps profile. What to Watch Out For? Look out for phoney testimonials. Genuine reviews will usually be at least a few sentences but usually a full paragraph. They’ll say something specific and unique about the service that was provided and they’ll have their names and wedding venue available for you to see. One line reviews such as “The wedding DJ was great” should ring alarm bells. 8: Do Any Venues Recommend You? Wedding coordinators know that really great wedding DJs are hard to find so they snap them up as soon as they find them. If a good wedding DJ has been working for any length of time they will have naturally picked up venues that will recommend them along the way. Ask what venues they work at regularly, if the venues recommend them and how long they have been recommended by them? Venue recommendations are the BEST way to know that you’re choosing a great DJ because the coordinators see the work they do time and time again. They know that they will deliver a great service every time and are so confident in their ability that they are willing to suggest them to their own customers. What to watch out for? It’s always a good idea to contact the venue and check that they are a real recommendation. It’s very easy for wedding DJs to say that they are recommended by a venue just because they have worked there before, but not ACTUALLY be recommended by the venue. 9: How Long Have You Been In Business & Is It Your Full Time Business Or Just a Part Time Job? When you’re paying a deposit quite far in advance it’s important that you check the business is stable and going to still be around in 12-18 months time! If they go out of business then your money is lost and you’re left with no wedding DJ. Look for a wedding DJ that has been in business for many years and can prove they are here to stay. Whilst there are some good part-time DJs it’s always safest to go with one who makes weddings their full time business. That way you can be sure that they are committed, experienced and dedicated to making your event a success. What To Watch Out For? Avoid wedding DJs who only DJ on the side, doing one or two gigs a month. They won’t have the experience to make your night memorable or the cash flow to maintain equipment. If it’s only a side job for them then they are more likely to jack it in if better a full time job comes along that gets in the way. You want a DJ who is out working every weekend, who gets booked up in advance and who makes your wedding a priority. 10: Will You Play Requests From The Guests On The Night? A great DJ will know that your guest’s requests can help make an awesome party. He’ll be willing to accept requests from your guests on the night in addition to your playlist, and will have a comprehensive track library with music from all eras and genres. Ask him if he provides request cards and pens on the night and how he handles requests that he knows will kill the dance floor? What To Watch Out For? Be careful of wedding DJs who seem to be very “opinionated” about the music choices. A great DJ will be experienced enough to know that no two weddings are the same and that every bride and groom’s music taste will vary. They should offer you advice on what will and will not work, but not be too pushy or judgemental of any music. 11: How Do We Know That You’re Really As Good As You Say You Are? A slightly forthright question, I know, but a very good one all the same. All wedding DJs will tell you how great they are but how can you verify what they are telling you? A great wedding DJ will be able to provide references in the way of client testimonials including names and contact details if requested. They’ll be able to give you a list of venues that recommend them and wedding planners that have worked with them before. They might have won awards or be members or the relevant DJ associations. Check out their reviews on Google Maps and on their Facebook page too. What To Watch Out For? Be careful of wedding DJs that don’t show up online. If they have been in business for any length of time then they’ll have an internet presence. They’ll have a website, a Facebook page, Google business listing and will show up in image searches too. If you can’t find anything about them then it’s possible things are not quite as they seem. 12: How Long Have Your DJs Been DJing & How Many Weddings Specifically Have They Done? It’s important that you choose a DJ that’s experienced in weddings specifically. Not a club DJ, pub DJ or mate with some decks. 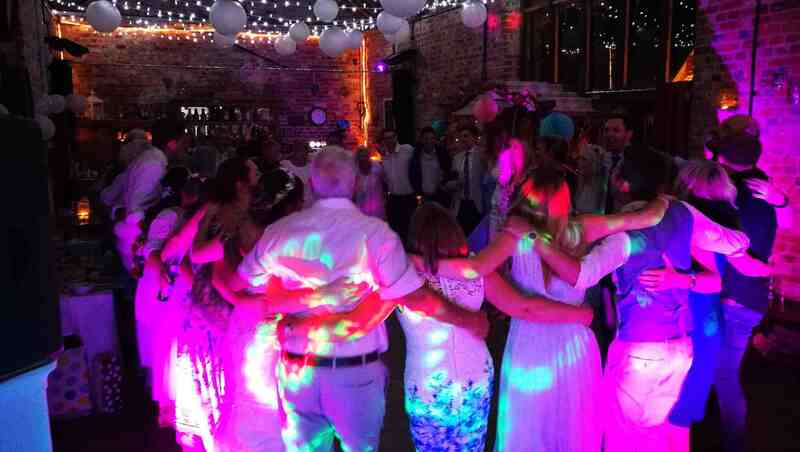 A professional wedding DJ will be used to working with tight deadlines, high pressure and a mixed crowd. They’ll know how to keep everyone happy, from kids right through to great Aunt Agatha. Ideally you want your DJ to have worked weddings specifically for at least 2-3 years. They’ll be able to offer advice on timings, your first dance and any of the necessary announcements. 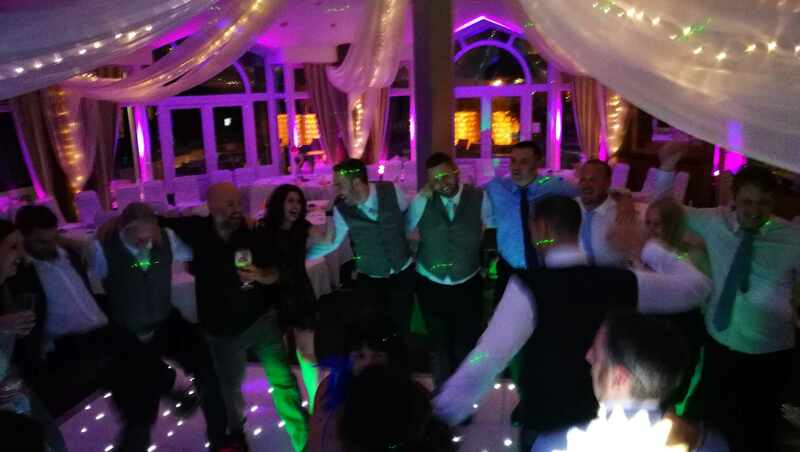 A great wedding DJ will get lots of referrals and will be in high demand so be prepared to book in advance. What To Watch Out For? Be wary of DJs who are new to the business or just transitioning into weddings from another DJing profession. Weddings require a different skill set to other DJing gigs. Many DJs think that they can be a wedding DJ just because they can mix, but there’s much more to. Choose a DJ who is experienced in weddings, or ideally specialises in them so you can be certain you’re in safe hands on your special day. 13: What Happens Between Now & The Wedding If We Do Book You? Many inexperienced wedding DJs fail to understand the importance of the planning phase of your wedding. They think that as long as they get the music on your playlist and turn up on time that all will be well. But a really great wedding DJ knows that the planning is what makes your big day perfect. They’ll work with you in the run up to your big day, discussing timings, planning your first dance and helping you create an awesome playlist. They’ll be in contact with your venue to discuss access and provide them with insurance and PAT certificates. They’ll answer any questions you have and offer you guidance and support in planning the perfect party. If they’ve been in business for a while then they’ll have a set process for doing this and will be able to tell you what to expect every step of the way. What To Watch Out For? Watch out for wedding DJs who don’t send you contracts, confirmation letters or tell you what to expect between now and your big day. 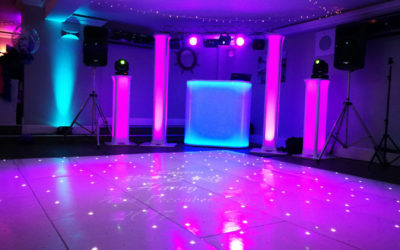 An experienced wedding DJ will be organised and structured. If they don’t have a system and plan in place then the risk of double bookings becomes high and you’re more likely to be let down on the day. 14: What Other Services Do You Offer? The less suppliers you have the simpler planning your wedding will be. 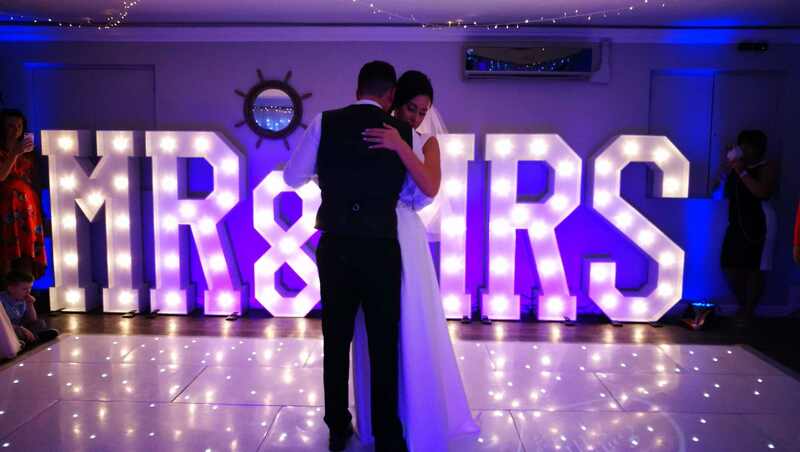 Many Wedding DJs have additional services to offer such as LED dance floors, LOVE letters, photobooths and uplighting and if you book a package deal you can get some great savings. Ask them for a full list of packages and services and see if they’ll do a bespoke offer too. This will help you to get the best deals and make planning your wedding easier and less time consuming too. What To Watch Out For? Be careful of wedding DJs who offer multiple services without bringing in extra staff. Your wedding DJ needs to be focused on your disco, not manning a photo booth too. It’s fine to book a package deal but be certain they have the extra staff to cater for it and don’t just split themselves between everything.